Northern Ireland, a part of the United Kingdom, is emerging from a period of conflict known as "the Troubles" and is attempting to implement an historic peace deal. Security has returned - though not without occasional reminders of the bad old days - and Northern Ireland has begun to reap the economic and social benefits. But divisions persist, finding physical form in the barriers that separate some communities. Preferences in schooling, sport and culture often follow ethnic and religious fault lines. 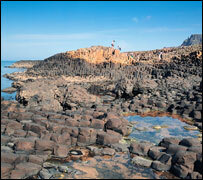 Northern Ireland is made up of six counties and forms part of the province of Ulster. Most of its people belong to one of two communities: the mostly-Protestant descendants of Scottish and English settlers and a mainly Catholic community. Religious and cultural traditions meld with politics. Unionists - who are mostly Protestant - want Northern Ireland to remain part of the UK. Nationalists - who are mostly Roman Catholic - have traditionally favoured union with the Irish Republic. Though a part of the UK, Northern Ireland manages many of its affairs along its own lines, including the education system and abortion legislation. The political entity of Northern Ireland was created by the 1920 Government of Ireland Act, which granted home rule but left six counties in the north as a part of the UK. The mainly-unionist population there had opposed being included in a home rule settlement. A unionist-dominated Northern Ireland parliament opened in Belfast in 1921. The ensuing decades saw systematic social discrimination against the Catholic and nationalist minorities. In the late 1960s, as the Catholic community stepped up a campaign for equal rights, the perception grew among some unionists that the Protestant dominance of Northern Ireland was under threat. Tension spilled over into violence and the British government ordered troops onto the streets in 1969. As the situation escalated, the British government imposed direct rule in 1972. Paramilitary groups, both republican and loyalist, became increasingly deadly. The bombings, shootings and sectarian brutality of Northern Ireland's Troubles were to last for decades. Over 3,600 people, most of them civilians, died. The violence spread to the British mainland. The landmark 1985 Anglo-Irish Agreement gave Dublin a voice in the debate about Northern Ireland. By the early 1990s London and Dublin had resolved to initiate multi-party talks. Paramilitary ceasefires and months of gruelling bargaining culminated in the 1998 Good Friday Agreement. The deal addressed differences over national identities in Northern Ireland, as well as the relationship with Dublin, which gave up its constitutional claim to Northern Ireland. 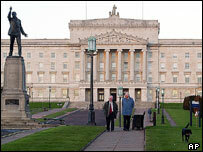 It set up a power-sharing mechanism and restored devolved government through the Northern Ireland Assembly. Voters in Northern Ireland and the Republic backed the deal in referendums. But implementation of the agreement has been tortuous. 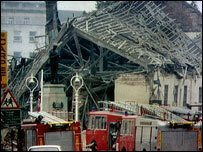 The assembly was suspended in 2002 amid a row over alleged activities of the Irish Republican Army, the IRA. In a bid to restart the political process and after consultations with Dublin, London passed emergency legislation in spring 2006 enabling the recall of the assembly in May of that year. But assembly leaders missed a November 2006 deadline to form a power-sharing executive. Assembly elections in the following March led to the eventual swearing-in of the leaders of the power-sharing government on 8 May 2007, ending five years of direct rule from London. Hopes of a permanent end to violence were raised in summer 2005 when the IRA formally announced an end to its armed campaign. Soon afterwards the arms decommissioning body said it was satisfied that the IRA had put its weapons beyond use. However, dissident republican groups such as the Real IRA and Continuity IRA still represent a threat to the peace process. The killings of two soldiers and a policeman by dissident republican factions in March 2009 raised fears that such paramilitary groups still had the capacity to undermine the achievements of the Good Friday Agreement. The Northern Ireland tourist industry has already begun to reap the benefits of the increased peace and stability that followed the implementation of the power-sharing agreement. For its growing number of visitors, Northern Ireland offers lakes, mountains and a rugged coast that includes the basalt columns of the famous Giant's Causeway and miles of sandy beaches. Its cultural contribution includes the poetry of Seamus Heaney, much of it evoking local life, and the music of Belfast-born musician and songwriter Van Morrison. The Good Friday Agreement provides for the administration of Northern Ireland by an elected assembly and executive with ministerial posts distributed according to party strength. The British government's Northern Ireland Office, headed by the secretary of state for Northern Ireland, oversees constitutional and security matters. It deals with economic and social affairs when the Northern Ireland Executive is not operating. Northern Ireland returns 18 members to the British parliament. Since 2007 power in the Northern Ireland Executive has been shared between two parties traditionally considered it be on the more extreme wings of Unionism and Republicanism - the Democratic Unionist Party (DUP) and Sinn Fein - while the hitherto more dominant and more moderate Ulster Unionists and SDLP have been marginalised at the polls. The DUP's Peter Robinson succeeded veteran leader Ian Paisley as first minister, with Sinn Fein's Martin McGuinness serving as deputy first minister and de facto co-leader of the Executive. The Rev Paisley, a firebrand Protestant minister, and Mr McGuinness, a former leader of the Provisional IRA, developed a surprising rapport. Mr Robinson, a long-time party worker rather than street campaigner, has continued to work with Mr McGuinness, although tensions remain in this unlikely marriage of convenience. Mr Robinson had to step down as first minister briefly in 2010 during an investigation into a financial scandal involving his wife Iris, who was also a member of the Assembly and the British Parliament. He was cleared of wrongdoing, and went on to complete the delicate process of devolving police and justice powers to the Executive. The DUP and Sinn Fein both saw their positions improve at the expense of other parties at the 2011 Assembly elections, and the coalition seems set to continue. 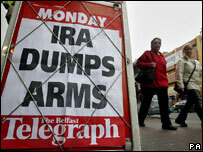 Northern Ireland has three daily newspapers; two of them reflect its political divisions. Some of the UK's major dailies publish tailored editions for readers in Northern Ireland. The UK's national radio and TV networks are available alongside dedicated local services from the BBC and commercial stations. Stations from the Irish Republic are widely available; two thirds of viewers in Northern Ireland watch TV channels from the Irish Republic, according to UK broadcasting regulator Ofcom. Can devolution work in NI?